What's the biggest number you know in your language? Do you have a word that isn't an actual number but means a really really big number? In this session we have some fun facts and figures about big numbers and also advice on how to pronounce and write them. In this edition of 6 Minute Vocabulary, Callum and Finn talk about big numbers in English: how to say them and how to refer to them indirectly. We also hear some impressive statistics about Russia. Hello and welcome to 6 Minute Vocabulary with me Callum. And me Finn. Today we’re talking about large numbers. Particularly how we say and describe them in English. Here’s Anita, who’s giving a talk to a tour group visiting Russia. Listen out for the answer to this question: How many metres high is Mount Elbrus? Russia is a land of superlatives! At over 6,500,000 square miles, it's the largest country in the world. And the total area of cultivated land has been estimated as a six-figure number: perhaps 500,000 square miles. 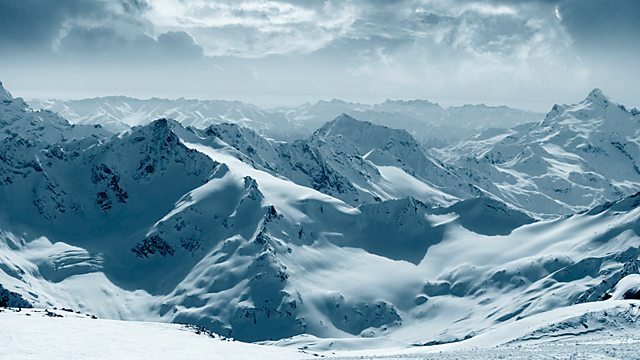 Its mountain ranges contain Mount Elbrus, which at 5,642 metres is the highest point in both Russia and Europe. Of its rivers, which are in the hundreds of thousands, the River Volga, the longest river in Europe, is the most well known. And what about the people? Well, here’s an interesting fact: the number of languages spoken in Russia is in triple figures – yes, over 100! So that was Anita. And we asked: How many metres high is Mount Elbrus? And the answer is five thousand, six hundred and forty-two metres high. Which is a good example of our topic today. When saying a large number, we always begin with the biggest number first. So thousands, then hundreds, then tens. Tens means numbers with two digits in them, like forty-two. Listen again. Five thousand, six hundred and forty-two. And the other point is, that the number labels are always singular. So five thousand and not five thousands. Six hundred and not six hundreds. Exactly. Now, notice that we don’t connect thousands and hundreds with the word and. It’s five thousand, six hundred. Not five thousand and six hundred. But we do connect hundreds and tens with the word and. So six hundred and forty-two. And I think it’s time for our first clip. Russia is a land of superlatives! At over 6,500,000 square miles, it's the largest country in the world. And the total area of cultivated land has been estimated as a six-figure number: perhaps 500,000 square miles. So we heard six million, five hundred thousand. Notice that we don’t connect millions to thousands with the word and either, or in this case, millions to hundreds of thousands. We say it like this: six million, five hundred thousand. Now, how did Anita describe the figure 500,000? She described it as a six-figure number. Because it contains six digits. We could also say it’s a six-digit number. Yes, we sometimes describe a number in this way to emphasise how big it is. And it doesn’t have to be six. It could be a five-figure or a four-figure number. Now, on to clip 2. Of its rivers, which are in the hundreds of thousands, the River Volga, the longest river in Europe, is the most well known. And what about the people? Well, here’s an interesting fact: the number of languages spoken in Russia is in triple figures – yes, over 100! So how did Anita describe the number of rivers in Russia? She said they’re in the hundreds of thousands. When we want to describe approximately what a number is, we can say it’s in the tens, the hundreds, the thousands and so on. Hundreds of thousands means at least 100,000 and probably a lot more. So you could even say that a number is in the tens of millions. There was also an interesting fact there about the number of languages spoken in Russia. Anita said they’re in triple figures. That means that the number contains three figures – so at least 100. It’s the same as saying that the number is in the hundreds. 6 Minute Vocabulary from bbclearningenglish.com. And it’s quiz time! Number one: How do we say this number? 8-9-2-1. That’s 8-9-2-1. It’s eight thousand, nine hundred and twenty-one. Well done! Number two: What kind of number is 300,000? Is it: a) a five-figure number b) a six-figure number c) a six-figures number? It’s b) a six-figure number. Correct! Number three: Listen to this number: 19,242. Is it a) in the thousands b) in the tens of thousands c) in the hundreds of thousands? This one is b) In the tens of thousands. Excellent! How did you do? Very well done if you got them all right. There’s more on this topic at bbclearningenglish.com. Join us again for more 6 Minute Vocabulary. You can download 6 Minute Vocabulary from our Intermediate Unit 25 Downloads page. Remember, you can also subscribe to the podcast version. They’ve cut hundreds of thousands of pounds from the budget. Their assets alone must be worth in the tens of millions. The number of emails waiting for me after my holiday was in triple figures. I’m not sure what he earns, but it’s certainly a six-figure number.